One of the first things you’ll need to do when adding new bulk storage is find out what the local requirements are for installation. The requirements vary among states so it’s important that you find out the provisions specific to your area. And the requirements for permanent installations such as a storage tank on piers will likely be different from those for skidded or other similar semi-permanent vessels. 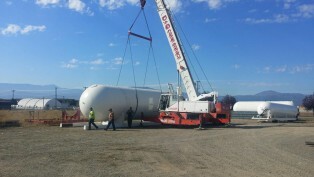 The storage tank itself doesn’t generally require any approvals as long as it conforms to ASME rules for construction of pressure vessels and is National Board certified. A good first step to understanding the requirements in your specific area is to speak with someone at your state propane gas association. If you’re not sure who that is, the National Propane Gas Association (NPGA) has a list of all the affiliated state propane gas associations. The list includes websites and contact information for the person responsible for your state. Click here to view the list. When we investigated install requirements for a California customer, we reached out to the Western Propane Gas Association (WPGA). The people there were very helpful and provided the contact information for a consultant they work with that has extensive experience with California propane tank installations. It was through him we learned that in California even skidded storage must be placed on a concrete pad. And, not surprisingly, there is additional focus placed on concrete reinforcement that will meet local seismic zone requirements. Next, I’d call the state or local fire marshal. The fire marshal will either have final decision making authority for your installation or will at least be very involved in the process. The scope of their jurisdiction can include requirements for inspections, insurance, training, state licenses and fees, submission of plans, site approval, reporting and other preconditions. We recently spoke to the Deputy State Fire Marshal for the state of Georgia about an LPG skid installation. He said that he does not believe his office has had a request for a semi-permanent pressure vessel installation in all of the 20 years he has been there. That’s not surprising to me since skidded LPG bulk storage is fairly new technology. He did say however, given that these are ASME compliant, National Board certified storage vessels he didn’t anticipate any problems with it and referred us to an engineer in his department for clarification of the requirements. View the rules and regulations from the Fire Marshal for the state of Georgia. A short time after publishing this post, I received a letter of acceptance from an engineer working for the Georgia Deputy State Fire Marshall. The letter spells out the requirements for installing LPG skid tank systems in the state of Georgia. The letter also makes reference to the “Georgia Rules and Regulations 120-3-16“. For anyone in Georgia looking to add LPG bulk storage, these two documents will provide your requirements and a great place to start! Another good resource is the state pressure tank inspector. In many areas, these inspectors have final authority as it relates to the rules and regulations relating to installation of LPG storage. At the National Board website you can find the National Board Synopsis which is a compilation of laws, rules and regulations. The synopsis also includes pressure tank inspector contact information for each state, province or local area. There is a little bit of legwork needed in preparation for your installation of LPG bulk storage. Unfortunately, there isn’t a nationwide standard so it is necessary to determine requirements specific to your location. The good news is, there are resources available to help. Give the folks listed in this article a call and if you get stuck along the way, don’t sweat it. Give us a call and we’ll do what we can to help.